An annual procession occurs in Australia that offers Sydney shoppers the reason for the season. The students prayed before the Blessed Eucharist in the Catholic Chaplaincy chapel before the procession through Sydney streets. 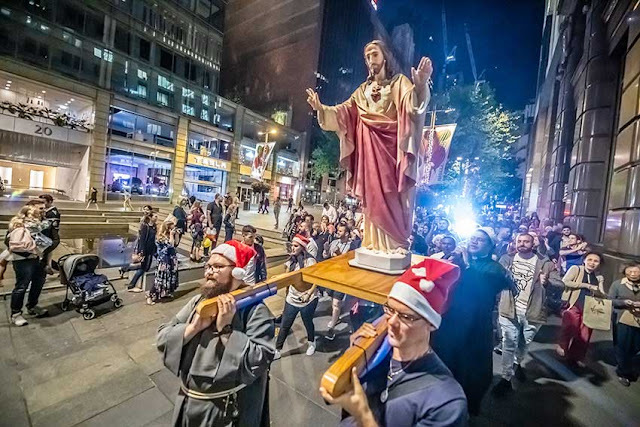 Hundreds of festive Catholics processed a statue of Jesus through the streets of Sydney, while answering questions about Christianity and Christmas from onlookers, sang Christmas carols and handed out prayer cards to shoppers on a Saturday evening in December. The procession, organised by the Maronite Catholic mens’ group, the Knights of the Immaculata, saw large numbers of students from the Catholic Chaplaincy at the University of Sydney also participate. Although they’ve been running the event for seven years, Saturday’s procession was one of the biggest and most successful ever. Starting from the Sydney University Catholic Chaplaincy at Broadway, the procession marched down Abercrombie Street to Central Railway Station, before heading up William Street to St Mary’s Cathedral. For anyone who wanted to join in the carolling, plenty of spare song sheets were handed out as well. After arriving at the cathedral, the students headed across the road to Hyde Park where they paused to pray a decade of the Rosary. The procession then wound its way past the Law Courts, down Martin Place to Town Hall before heading back to the Broadway Chaplaincy.